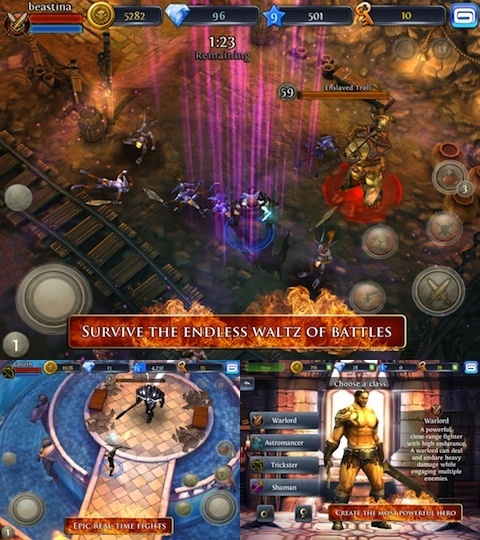 Dungeon Hunter 3 is an action RPG from Gameloft, which can be played on the iPhone, the iPad, or the iPod touch. In the game you are given the choice of four different classes, and then you’re sent off to kill enemies and earn achievements in the various locations present within the Dungeon Hunter world. Let me start off by saying that the graphics in Dungeon Hunter 3 are pretty fantastic for an iPhone app. Though they aren’t necessarily the sharpest, they definitely are gorgeous and they really nail home exactly what they were going for. Overall, the graphics pretty closely resemble a style akin to the Diablo series. Unfortunately, the gameplay does not. There is quite a bit of customization, allowing you to equip armor which adds different bonuses to your character while also changing the way that they look while they’re fighting on the field. However, with the addition of four different classes I was kind of expecting to see some sort of manual skill tree, or some way to level up your characters that didn’t involve upgrading or buying various sets of armor. Unfortunately, all leveling up is done automatically, so you have almost no control over how your character progresses. The two toggle controls can serve to be pretty confusing, and at times I ran into a bit of a glitch where the app itself was forcing me to attack in a different direction than I wanted. I also found myself accidentally switching my weapons every so often, because the button to activate that command is not even a centimeter away from the joystick you use to move around. The entire control set up is just not very easy to manage, which is a big disappointment in what could’ve easily been a really fun app. I wasn’t a huge fan of the overall point of the game, as it ends up being more of a run-around-while-holding-down-this-button-until-you-win situation. And while those can be fun for a few minutes, I easily get tired of them and want to move onto something more expansive and less frustrating. At first I’d written off the entire thing as something I’d probably delete in a few days, especially considering the fact that it takes up a generous 844MB, making it the largest application I have on my iPhone while also having a 600MB lead on all of my other apps. However, upon further review of the entire thing, I can definitely see how I might enjoy playing through a few levels every now and then. Overall, I’d say that it’s worth trying the app out, if you actually have the space for it. Though definitely not the best app out there. 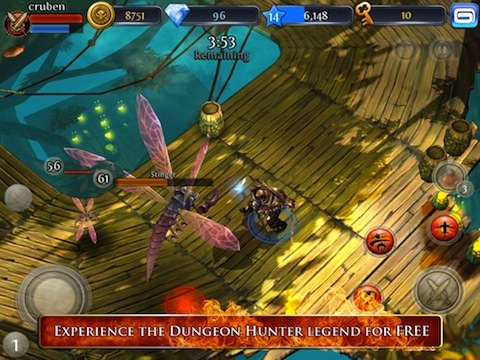 AppSafari review of Dungeon Hunter 3 was written by Ryan C. Robert on December 23rd, 2011 and categorized under Action, App Store, Free, Games, iPad apps, RPG, Universal. Page viewed 6279 times, 2 so far today. Need help on using these apps? Please read the Help Page. 1. Cannot find any DH3 gems except the few that had to be used during mandatory tutorial. A few popped up during the game but have no idea where they came from? Should there be gems to find? all the screen shots show thousands of gems. 2. Cannot redeem collections rewards even though screen implies it should be an option. Pressing Redeem button makes a clink sound but nothing else? 3. Cannot find any detailed instructions or references anywhere, including your website. Plenty of cheat sites, not what I am looking for. 4. Made it to about level 25 with a Warlord and did some upgrades. Also had second character, Astomancer, at about level 13. While waiting for the upgrades, that is, not using ipad2, pushes prompted the upgrades where complete and to come try them out. Well the program wouldn’t open, it would get to the startup cover screen with the little circle turning in the bottom right corner then closed. After several attempts, I turned ipad2 off, restarted ipad2 and DH3. DH3 started first character over, my level 25 character gone. Could not stop the mandatory tutorial so was forced to make new character. Game remembered my level 26, lost all upgrades, kept the gems and added new ones from mandatory tutorial except for the ones needed during the key purchase to 10, which the second attempt programmed into the tutorial cancelled the purchase. Lost all of the first Warlords completed arenas and their completed missions. WHAT? I realize this DH3 is a new game, are the levels limited unless gamers purchase something? if so, how much does it cost and at what level? Are ther other websites, socials, game sites that review and ID game flaws that could be more helpful?